Copyright © 2013 Marcos Martins Curi et al. This is an open access article distributed under the Creative Commons Attribution License, which permits unrestricted use, distribution, and reproduction in any medium, provided the original work is properly cited. Pyoderma gangrenosum (PG) is a rare disorder of skin commonly associated with systemic diseases such as inflammatory bowel diseases (IBD), haematological disorders and autoimmune disease . PG has been reported to occur in about a third of the IBD population . Although its etiology still unknown it may be an autoimmune disorder. Clinically, this disorder is characterized by painful papulopustules which can progress to large and irregular ulcerations [1,2]. PG may affect any part of the body, but there are more common sites of involvement such as lower extremities, buttocks, abdomen, face and rarely forehead, scrotum and eyes [2,3]. Oral involvement is rare, but ulcerations may appear as a manifestation of this disease . 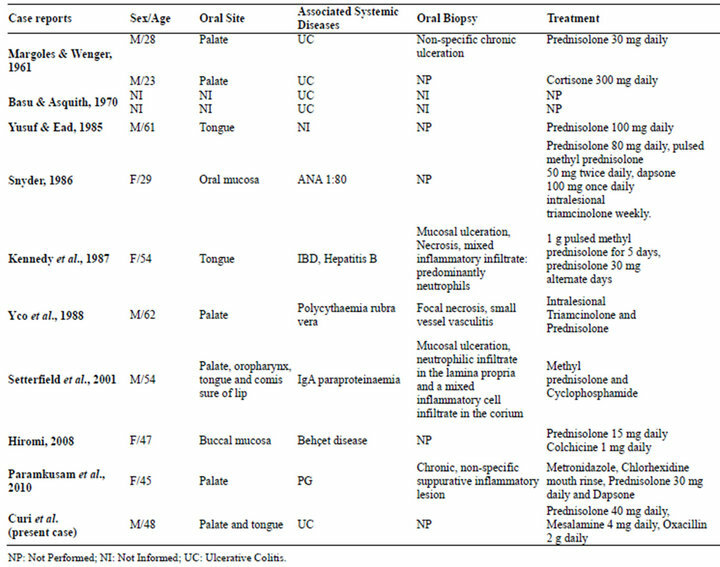 A Medline search in English literature from 1961 to 2011 revealed only 11 documented cases of PG with oral involvement and this case report illustrates a new occurrence associated with Ulcerative Colitis (UC) [1,2,4-10] (Table 1). Table 1. Cases of PG with oral involvement reported in the literature. Figure 1. Clinical aspects of skin lesions. 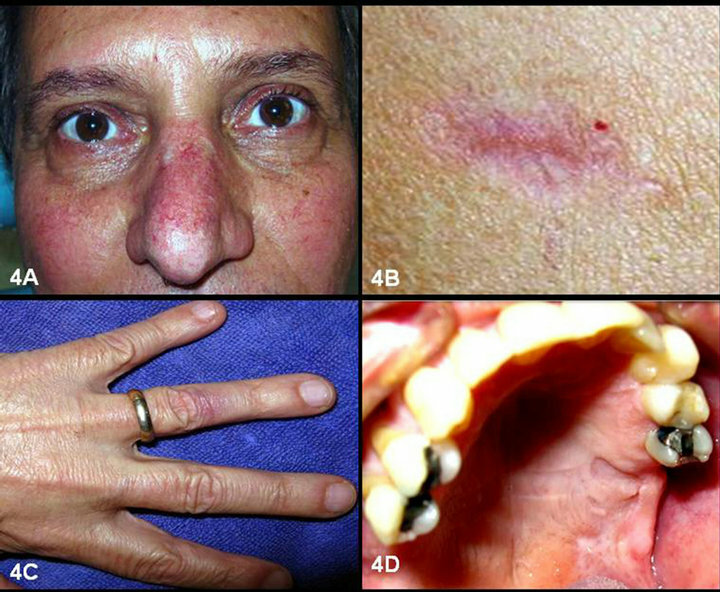 (A) Lesions affecting the chest; (B) Detail of the lesion; (C) Lesions in the face, eyes and (D) finger. Figure 2. (A) Clinical aspects of oral lesions; (B) Ulceration in palate and tongue. disease using systemic steroid therapy (Prednisolone 40 mg daily) and (Mesalazine 800 mg daily) associated with antibiotic therapy (Oxacillin 2 g daily). The oral lesions were managed with local therapies using Chlorexidine 0.12% mouthwash and topical corticosteroids. After a week of treatment, we observed rapid and complete resolution of the mucocutaneous lesions, as well as the signs and symptoms of UC (Figure 4). Figure 3. Photomicrography of colonoscopy and biopsy of the skin, respectively. 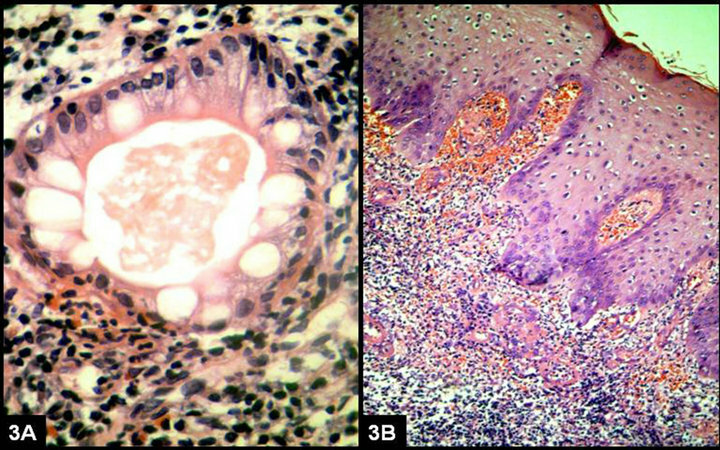 (A) Intense inflammatory infiltrate composed of polymorphonuclear cells, plasmocytes and few eosinophils causing disruption of the glandular tissue colonic; (B) Hyperplastic stratified squamous epithelium with acanthosis and focal subepithelial hemorrhage. The connective tissue revelead an intense and diffuse inflammatory infiltrate with some neutrophils and plasmocytos in perivascular areas (HE). Figure 4. 3 months follow-up showing the remission of mucocutaneous lesions. Pyoderma gangrenosum (PG) is a rare neutrophilic dermatosis first described by Bursting et al. , in 1930, who published 5 patients with skin lesions and 4 of whom associated with Ulcerative Colitis (UC). It is characterized by recurrent cutaneous ulcerations commonly associated with systemic disease (inflammatory bowel disease (IBD), rheumathoid arthritis, inflammatory polyarthritis, myeloma, paraproteinemia, polycythemia vera, acute and chronic myelogenous leukemia, chronic hepatitis and Behçet’s syndrome), while in 40% - 50% cases no systemic disease is observed . Skin lesions have been described as ulcerative lesions with central necrosis and irregular violaceous border tenderness with undermined rolled edges. Also, they can be solitary, multiple or present different clinical aspects . It predominately occurs in adults between the ages of 20 - 50 years and rarely affects children . Because the microscopic findings of PG and the laboratory tests are nonspecific, the diagnosis is based primarily on its clinical manifestations. In our case, PG was diagnosed through clinical examination by a dermatologist and it was confirmed by microscopic findings. UC presents a slight male predilection, significant morbidity, but low mortality . The main signs are chronic diarrhea with blood, weight loss, fatigue and abdominal pain. Criteria for diagnosis of UC is based on clinical findings, colonoscopy and sampling of intestinal mucosa. In this case, diagnosis of UC was done 15 years ago through the above mentioned examinations and this was the first time period associated with PG. Despite of the previous medical history, a new colonoscopy with colon biopsy and laboratory tests confirmed the diagnosis of UC. In patients with inflammatory bowel diseases (IBD), PG occurs in approximately 5% of cases with UC. Our case shows this well recognized association found in the literature. Extraintestinal manifestations of the IBD are common and they can be found in 6% - 47% of cases reported . Oral involvement of PG is very rare . There are only 11 reported cases (Table 1) of PG involving oral cavity in the literature [1,2,4-10]. Oral lesions in PG are characterized by irregular shaped ulcers of varying sizes in diameter with rolled out margins and a grayish colored base and affect mainly the tongue, soft and hard palate [1,2,4-10]. Where oral lesions occur in association with IBD, they should be differentiated from other oral ulcers such as aphthous ulcers and pyostomatitis vegetans (PV) . PV is another rare condition which can develop in association with UC and is characterized by pustules, erosions and vegetative plaques in the oral cavity . The histopathological features of PV are very characteristic  and show hyperkeratosis and acanthosis intraepithelial abscesses and a prominent eosinophilic and neutrophilic infiltrate in the lamina propria . Since the first reports of PV, approximately 37 cases have been documented in the literature . Previous cases report of oral cavity involvement in patients with PG have shown that the most common sites of manifestation are the tongue, palate, and tonsillar fauces. Among these 11 previous reported cases, 5 patients developed oral lesions on the palate and 3 patients had lesions on the tongue. In this review, PG was associated with IBD in 5 patients, usually UC. The treatment of the oral lesions depends on the correct diagnosis of the systemic disease and appropriate selection of local and systemic therapies. When PG ulcerative condition is well established, it is essential to investigate super added microbial infection by haematological and swab cultures to treat with appropriate antibiotics . In our case, the treatment consisted of systemic therapy, involving corticosteroids and Mesalazine to control the IBD, associated with antibiotic therapy to treat the super added infection. After one week of treatment, the systemic therapy resulted in a complete and fast resolution of the mucocutaneous lesions. In addition, the oral lesions were managed with antiseptic and topical corticosteroids mouthwashes. Finally, although the oral involvement of PG is very rare, it should be considered in patients with IBD and skin ulcers. This case emphasizes the importance to consider this entity as differential diagnosis of ulcerative lesions in the oral cavity.